Bethany is having a Blogiversary Party and it is game time!!!! 1. What was your age when you first discovered your love of yarn? What (or who) was it that introduced you to all that fibery goodness? Only my favorite loomy friends: Jenny, Karen, Bethany, Graciela, Trudy, and Dianne…and probably a few others as well! 4. Like our heroin in the story below, do you ever dream about soft fuzzy goodness? Or how to do a particular technique you’d never thought of while awake? All….the….time! 5. What type of loomer/knitter/crocheter are you? Do you like long involved projects, or quickies full of fast satisfaction? I like quick projects. I find myself getting frustrated if I am taking too long to do a project. 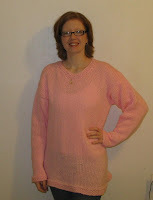 To me, I had no excuse to take 2 weeks to make a sweater! 6. Have you ever guiltily postponed dinner due to your involvement with a project? Um….too often. 7. What is your ultimate goal in your yarn life? I want to be famous. 8. Do you have a favorite snack you like to munch while working with yarn? Anything that only requires one hand a I can do little nibbling. 9. What is your all time most favorite yarn tool/accessory that you absolutely could not live without? The little plastic case that I use to hold my scissors, crochet hooks, yarn needles, measuring tape, stitch markers, pins, cable needles and stitch holders…OH, and my pick tool! 12. What are you working on right now with your yarn? 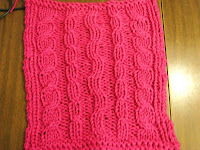 A lace scarf that I am designing on the Kiss, a knitted tote that is on the Kiss, a sock on my DA sock loom, another lace scarf on needles. 14. Did someone invite you to join in on the party today? You did! I am sure I was first on your guest list!!! Make sure that all of you go join Bethany’s Blogiversary Party that is taking place RIGHT NOW! GO! NOW! Or you will miss it!!!!! It is for my sister for her 22nd b-day on Aug. 10th. 😀 I used Bethany’s pattern and you can find it HERE. It is very easy and fairly quick if you have the time to sit down and focus on it, unlike me who was trying to do three or four different things at one time. LOL! 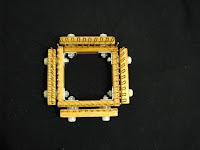 I have been bouncing from knitting needles to crochet hooks to looms and then back again for about a week or so. I have a lacy keyhole scarf on my needles, just finished up with three travel/neck pillows that I crocheted, and am currently working on my first ever sock on my DALooms EFG Sock Loom while the knitting tote I am designing is on my Kiss Loom. Does that sound CADD (Crafty Attention Deficit Disorder) to you? Hahaha! I think this is like..the second MEME I have done on here. Well, since it is Saturday and that is family fun day, there isn’t many chores. ….I think that is it! 4. Things I would do if I were a billionaire. 6. Jobs I have had. 7. Who would I like to know more about. If you read this consider yourself tagged or not. Just let me know in a comment if you decide to do it. Then I have been working on a collection of patterns that I have named the ‘Jeannette Collection’. Why the ‘Jeannette Collection’, you ask? Well, if we flash back to my absolutely AWESOME, OFF THE HOOK, DA BOMB birthday, you’ll remember tha t Jeannette sent me some Lion Wool to make myself a felted baguette b/c I was all pouty for sending the one I had currently made, to my mom (WHO ISN’T USING IT! What is wrong with that woman?! :P) Well, she should have known that I was going to totally make it all my own. And an entire collection at that! 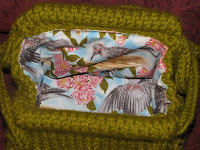 I still am working on the felted knitting tote, but I have the felted purse and wallet finished. 😀 I will post a pic later of the liner I have put in the purse. It is purty liner material. LOL! Oh, and these are all done on the Kiss Loom. I made that decision on purpose for the fact that there are so few patterns out there for the Kiss Looms…I needed to create some! 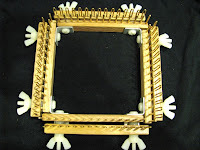 My good friend, Cliff (the creator/maker of the Kiss Looms) asked me if I would mind making an updated set of assembly instructions since he added hex nuts that can be used in place of wing nuts. OF COURSE! I would have beat myself up forever if I had said no! I mean, I LOVE these looms! I have to force myself to get the specified loom out for a pattern I am following so that I will actually use the other looms. LOL! And, I was tired of fighting myself about putting up my Kiss Loom pieces into the storage box in the family room where I keep all of my other ‘not in use’ looms. I decided to clean out an entire drawer in my yarn storage ‘center’ to put all my Kiss mod pieces. OH! And before I forget….I really MUST brag about myself since I am so very proud. 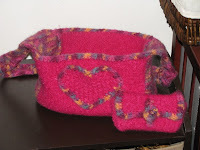 I will be submitting a tutorial to the Loom Knitter’s Circle online magazine for the fall edition. Oooooo, another tutorial? Why is this one under wraps? Well, ladies and gents…b/c I believe I have stumbled upon something that I haven’t seen anywhere else on the blogs and tutorials and videos I have watched. It is the looming method of doing the needle knitting increase that is commonly called the KFB or ‘knit into the front and back loop’! 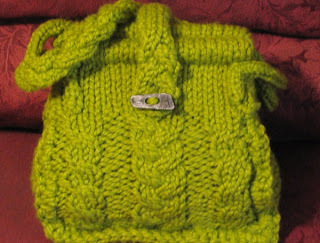 Keep your eyes open for me in the fall issue with the tutorial and a simple pattern!